1. Is there an internal team set up to manage the evaluation and eventual implementation? It’s an exciting time when you’re finally given that OK to research vendors, and it’s easy to start downloading white papers and calling contact-us numbers, but have you really involved enough people in the conversation? It’s not uncommon to hear of halfway-completed implementations that come to a sudden stop due to internal processes breaking or people left out of the initial conversation who now want to suggest a change. Getting the right people involved early is key to a smooth and successful implementation. It’s important to make sure you’ve accounted for all the departments that could potentially be impacted, and given them a seat at the table so they are engaged throughout the evaluation and implementation process. Start by setting up one-on-one meetings with key players from each group, taking time to understand how their department functions and what processes they have and might want to improve on or develop. Assign tasks to these key stakeholders and work diligently with them to develop a vision for how marketing automation can benefit them. Get an understanding of your IT and CRM administration departments’ knowledge and experience with system integrations as they will most likely play a big role in the eventual implementation. Select departments which may benefit or be affected by a new system implementation. Set up initial process-sharing meetings with departments and identify key stakeholders. Create new and/or gather existing process documentation. Educate and get your stakeholders excited about the general benefits of marketing automation. Create your implementation team and plan to set up recurring meetings. 2. What internal and third-party tools does your company use? Which ones must remain? Which ones can you live without? Which ones would be nice to add? Just as you should get to know the thought processes that may be impacted by a new marketing automation system, you also want to take inventory of your internal and external applications. These tools may be assisting with data storage, event and webinar registration, data appending/cleaning, or social behavior, and analytic reporting. Assuring that you know what you have and how it’s used is helpful leading into your research or conversations with vendors as many of the vendors have a wide variety of third-party tools that can be integrated with the platform to help streamline processes you already have. What functions does it perform, and what departments/people benefit from its use? Is this an internally built or third-party purchased tool? If third-party, what is the current contractual status? How long has the company had it? Is it actively in use? What makes this tool successful? What things would you like to see changed or improved? If another tool was a better fit, would we be able to replace this tool? If unable to replace, why? 3. How large is your contact database across all internal systems? Your initial thought might be to just take your marketing or subscriber database under consideration, but what you should consider is all the other data within your organization that might be available to you. Database size is one of the primary factors that often determines how much you pay for a marketing automation system, so it’s important you consider all data sources. Is your sales team using a CRM disconnected to your current marketing systems or is it still using Excel to manage new and old client data? If one of your marketing automation goals is to streamline your outreach to customers (and it should be) then make sure to account for this sales data. Is marketing the only department that is collecting lead gen data, or do other departments have collection forms (i.e., contact us, download, sign-up)? Gathering all this data not only helps you get a more accurate quote, but it paints a more complete view of your audience. 4. How clean and accurate is your internal database? Now that you have uniquely identified all the data within your company, it’s important to evaluate both the quality and accuracy of these data sources. Having large amounts of data at your disposal can be a great thing, but if it is inaccurate and unreliable then it may cause more harm than good. Nobody wants to receive an email with the wrong personalized first name, or be addressed as a customer when they have no clue who your company is. And you don’t want to have emails bouncing left and right, landing in junk folders, or reported as spam. Count the number of duplicates by email address, then count the number of records which match by first name, last name, and company. Create columns for all the profile data points (name, title, company, industry, etc.) and begin to clean and create consistency across all values. Organize behavioral activity (such as record creation dates, download, and subscription sign-up dates) in new sheets and use a combination of formulas and “vLookups” to associate activity with each unique subscriber. From here you can evaluate which records are likely to be the most up-to-date. 5. Do you have a standard set of fields and values for which you collect data? If you have multiple departments leveraging and benefiting from the data collected through the new marketing automation system, then it would be wise to have a set of standardized fields and values for both segmenting and reporting. For example, if you have two departments collecting “industry” data, are both groups’ labels and input values the same? If using different systems to manage the data, are the API names for those fields the same? Create a list of fields and values used throughout the company to collect and manage data, then organize them by their uniqueness to one another, as well as their usefulness to the company’s objectives. 6. Have you created an inventory of all your internal offer assets, forms, landing pages, email templates, etc.? Whether your implementation (which you will be paying for) takes two, four, or six months or longer, part of that time will be focused on building some impactful campaigns for launch. Rather than chew up valuable time and resources during your main implementation phase, take stock of existing assets ahead of time and organize them by department and/or which product they promote. Next, determine which of these assets have expired or will soon, which will remain in place post implementation, and which need to be re-evaluated. 7. What is your budget for this project and does the platform build in flexibility for potential year-over-year price increases? Setting a budget will certainly help you initially narrow what marketing automation vendors you look at. But since the needs of every organization tend to change over time so might the functions of the marketing automation product you purchased. The good news is many of these systems have third-party integrations that can support additional features you may not have considered. If internal processes have changed to the point where you need assistance outside of the available resources you have, a number of good consultant companies can guide you to your goals. Keeping this in mind, be sure that you spend time considering and potentially budgeting for this additional functionality and services that may be available and work with your internal team to determine how these things might benefit you, not only now, but in the future. 8. 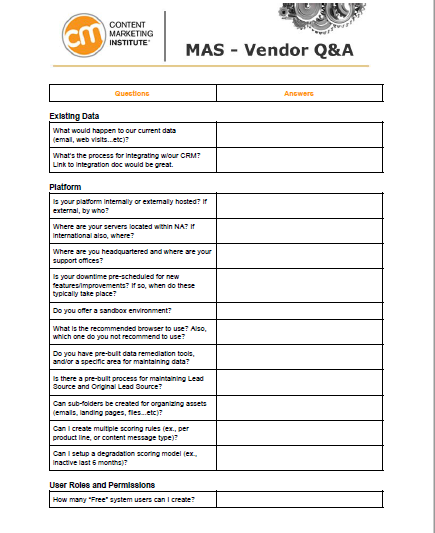 Do you know what vendor questions to ask? Staying organized throughout the vendor evaluation process is critical to a streamlined and successful implementation. However, this can prove to be difficult when your inbox is flooded by numerous sales reps vying for your attention and providing critical information as to why their tool is the best. Emails become misfiled, deleted, or otherwise ignored all because you’ve become overwhelmed by all the information. That is why creating your own Q-and-A document (answers supplied by vendors) is valuable. It gives you a consistent way to seek answers to your standard marketing automation questions and business critical questions posed to each vendor the exact same way. This allows for an easy side-by-side comparison of vendor answers. Keep your questions organized by a category, such as email, segmentation, integration, training, etc. This helps the vendors expedite the answers, ensuring that the right departments are fielding the right questions. 9. What browser(s) does your internal IT team support? This may seem trivial, but depending on the politics within your internal organization, getting an internal IT team to standardize the use of a new browser recommended by your potential vendor may prove difficult. As part of your internal IT team discussions, find out what browsers are supported and which ones are unacceptable. 10. Did you create a wish list? If you didn’t, then make one. Although it may not be as exciting as the one you would have made up as a child, it’s still a nice thing to keep handy when looking into vendors. Since your research up to this point likely explores a lot of the benefits of marketing automation, take time and think through all the reasons you’ve decided to move in this new direction. Take into account the conversations you have had with leadership and different departments, as well as those outside your organization who are familiar with the space. 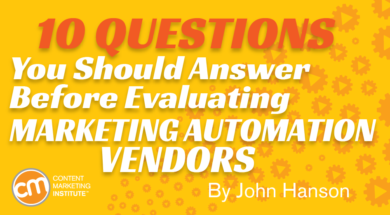 I hope that these questions as well as answers have shown how important it is to internally analyze and understand your business processes, systems, and goals before you spend too much time evaluating marketing automation vendors. Sadly, I’ve seen it all too often, once vendor evaluations are underway, internal pressures can quickly mount to select someone. You’ll be amazed at how much easier it is to evaluate vendors when you’ve been able to answer these questions first.